Human beings are social animals. We evolved while interacting in groups—cooperating, competing, feeding and mating with others. Individuals who connected with others and managed their reputation within these groups derived significant adaptive advantages; for example, these individuals benefitted from increased safety and enhanced access to resources. As a result, humans today value social information that indicates a connection or a good reputation with others. This valuable social information is crucial for making decisions and achieving goals in everyday life. For example, every decision you make in a social context, like what career you choose or what person you choose to partner with, is affected when you consider the value of your own reputation. Furthermore, people and corporations spend huge sums of money to influence others with this type of social information (e.g., luxury brands and advertising), and this rewarding social information also motivates people to interact and post about themselves on social media. Evidence also exists that aberrant social information processing underlies various psychiatric disorders. 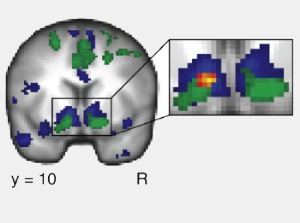 So how does the brain process valuable, rewarding social information? Are these social rewards processed in the same way as non-social rewards? How does valuable social information motivate us to act and make decisions in our complex social world? To answer these questions, the Social & Media Neuroscience Lab uses functional and structural neuroimaging, coupled with behavioral and online experimental methods (e.g., social media measures). Ultimately, with the knowledge gained by our research, we hope to contribute to a better understanding of socially motivated human behavior.